Liew (seated, third left) in a press conference held in Sandakan yesterday. 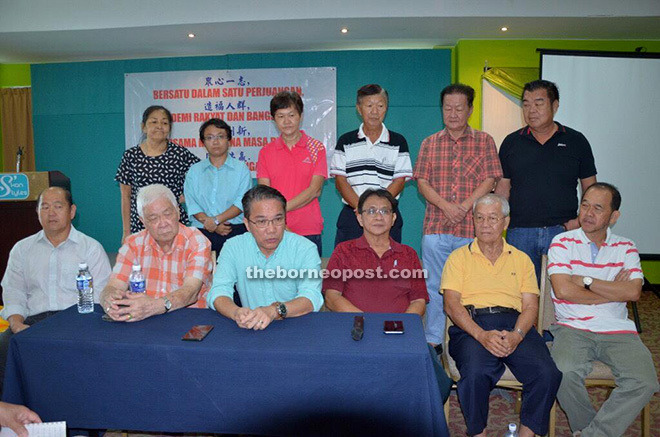 SANDAKAN: Former Liberal Democratic Party (LDP) president Datuk Liew Vui Keong who was recently appointed as permanent chairman of Parti Warisan Sabah (Warisan), led about 200 members to quit LDP here yesterday. Liew said the members involved were people who had been loyal in supporting him since the LDP leadership crisis in 2013 and he had set up a closed door meeting with them to enlighten them on his future political journey. He added that the meeting was held so that his followers would not be aimless in their political endeavours, and said it was up to his supporters if they wanted to join Warisan. “Many of us have been with LDP since its inception in 1989. In my case, I was with LDP in 1994 where I was the chairman of the Usukan division in Kota Belud, and in 2000, I became the Kepayan division chairman and then in 2008, I was the Tanjung Papat division chairman in Sandakan. “In September 2006, I was elected as the president of LDP. I then led the party to the 12th general election in 2008 where we won all the allocated seats we contested, namely the Sandakan parliament seat where I contested, Karamunting DUN (Datuk Peter Pang), Merotai DUN (Datuk Pang Nyuk Ming) and Tanjong Kapor DUN (Dayuk Teo Chee Kang). “Again in the 13th general election in 2013, I led LDP for the second time where we won three out of the five seats we were allocated to contest. We lost the Sandakan parliament seat where I contested, and also Likas DUN where LDP contested for the first time under Chin Shu Ying. “Little did I know that less than 100 days into my defeat in Sandakan, a movement to unseat me had begun to take place despite the decision by the Supreme Council earlier that had vetoed any contest to the top leadership. A leadership crisis ensued and it left a bitter taste in the mouths of many party members to this day,” Liew said. Thirteen divisional chairmen of LDP were then suspended from 2014 following the conflict and all the suspensions were only lifted last year, he disclosed. “Be that as it may, the decision to disembark from LDP was made fairly easy as we are not able to support the present leadership in LDP that has deviated from its principle and lost its direction. “What has happened has happened. We all have to move on in our political journey. Like the old Chinese saying, ‘a good horse will not eat the same grass again’. “I wish to put on record here that none of us bore any ill feeling towards anyone of them. I can only wish them all the best in their political endeavours,” Liew said in a press conference held at a hotel here yesterday. He said he believed that Warisan not only speaks about the change but will also make the change, adding that he particularly liked Warisan’s plan to have free education for Sabahans, especially at the higher learning level. Meanwhile, Liew said he was thankful to Warisan president Datuk Seri Shafie Apdal for having confidence in him to lead the office of permanent chairman. He clarified that his role as the party’s permanent chairman was quite different from that of party president. “Essentially, I am the party’s presiding officer. My duties are typically concerned with the party’s administration, finances, membership and the activities of the party organisation. “Together with my deputy, we’ll play roles in strategies to recruit and retain members, in campaign fundraising and in internal party governance, where we may serve as a member of, or even preside over, a governing board or council. “The Office of the Permanent Chair can also assist the president in candidate selections, and in the development and promulgation of party policy,” said Liew. However, he noted that the party’s permanent chairman should not be confused with the president of the party, who is the most powerful official within Parti Warisan. “He is politically the party’s chief representative. He is responsible for managing the party’s relationship with the general public. “As such, he takes a leading role in developing and communicating party policy, especially election platforms, to the electorate. He is also typically the public face of the party and the principal media contact. “The party president will compete in the general election and when he is elected into office, will lead the party to form the government when the party has won a majority in the State Assembly. “The permanent chairman can contest in general election subject to the approval of the party’s president and the Supreme Council,” Liew explained.